However, Charles Spence admitted careless driving and causing the accident which led to the death of 66-year-old biker Alexander Sinclair. The Crown accepted a guilty plea to a reduced charge on the second day of Spence’s trial at Dunfermline Sheriff Court. The accident took place on 11th June 2015 on the A985 Rosyth to Kincardine at its junction with the B9156 Dunfermline road. Mr Sinclair’s wife Janetta was a pillion passenger on the motorbike and she was badly injured in the collision. Spence, 38, of Fairhill Avenue, Hamilton, was originally accused of causing the death of Mr Sinclair by careless driving, which he denied. However, he admitted the reduced charge that he drove his van without due care and attention or without reasonable consideration for other road users by failing to keep a proper look-out, failing to observe a motor-cycle, driving his van on to the A985, causing Mr Sinclair to take evasive action and as a result collided with the van causing his death and causing Janetta Sinclair to sustain injuries. Sheriff Craig McSherry fined Spence £500 and imposed three penalty points on his licence. The court was shown the video taken from the front and rear of a passing bike. 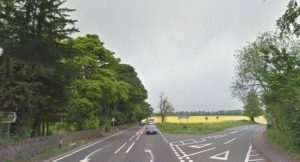 It showed Mr Sinclair riding along the centre of the east-bound carriageway of the A985 with his headlight on, the van appearing to move out and then a collision occurring. Mrs Sinclair (66), from Grangemouth, told the court they were travelling on her husband’s bike for a day out in Fife, as she had done since she was in her early 20s.